WANKULUKUKU – Express FC defeated Paidha Black Angels 2-0 at the Betway Mutessa II Stadium in Wankulukuku on Tuesday. 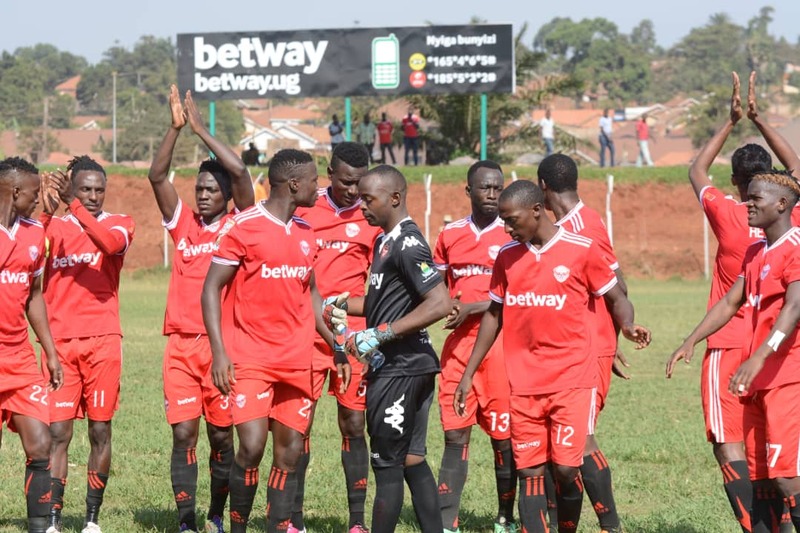 On a day that was highlighted by fans’ discontent, substitutes Tony Odur and Michael Birungi scored the goals for the Red Eagles, which saw them win their first league home game under George Ssemwogerere. Express who made up to three changes from the side that lost 1-0 away to URA last week, got their first shot on target which saw Brian Umony shoot straight at Paidha goalkeeper Benson Orom inside 5 minutes, following a quick restart after Ibrahim Kayiwa was fouled around the center circle. Express were struggling to assert themselves in the game with Paidha seating back and enjoying the Red Eagles’ lack of penetration and inability to create chances. Paidha’s Pascal Irasa became the first player to be booked on 26 minutes for tagging-back Frank Tumwesigye as the on-loan Vipers’ playmaker, dribbled past him. From the resultant free-kick, Brian Umony, while unmarked in the area, headed wide John Revita’s delivery. With frustration starting to set in for Express and a section of fans calling for Ssemwogerere’s head, Disan Galiwango was booked for a foul on Paidha midfielder Muhammad Kasirye, on 33 minutes. Moments later, as Express tried to counter, Irasa who was earlier booked, handled the ball around the center circle and was given his marching orders by referee Emmanuel Kiwewa who flashed him with a second yellow, meaning that the visitors had to play the rest of the game with 10 men. However, from then until the end of the first half, it was Paidha who were creating the chances and on 38 minutes, they got a glorious opportunity to take the lead but Jackson Nsubuga tapped wide after he was played in on goal by Ceaser Orega. At the start of the second half, Express took the initiative, dictated the flow of the game and pressed for a first goal. Despite the pressure, Express were still struggling to create chances and in response, they sent on Michael Birungi in place of Mubaraka Nsubuga on 53 minutes. 5 minutes later, Tony Odur replaced Ibrahim Kayiwa for the home side as they tried to add more fire-power upfront. Moments later, Lawrence Kigonya who had made several fouls since the start of the game, was booked for a foul on Orega as Paidha tried to forge a counter. After probing without creating a chance for the first 19 minutes of the second half, Ggaliwango picked out Odur in the box on 65 minutes but the former KCCA FC and Vipers’ striker headed weakly straight at Orom. A minute later, Ggaliwango was taken down inside the area by Kasirye and referee Kiwewa pointed to the spot for a penalty. Odur stepped up and despite Orom guessing the right direction, the forward found the back of the net to hand Express the lead. In response, the visitors called for their first change on 75 minutes, sending on Charlie Adams in place of Muhammad Kasirye. After what felt like an eternity as Express fans asked for Eric Kambale to be brought on, their cries were finally answered with the forward replacing the ineffective Umony 10 minutes from time. Three minutes from time, Birungi unleashed a shot from outside the area which found the back of the net to increase Express’s lead and seal three points. At the end of the day, it was three more points for Express who climb into 9th on the table with 32 points from 25 games. For Paidha, they remain seated at the bottom of the log with 12 points so far this season.